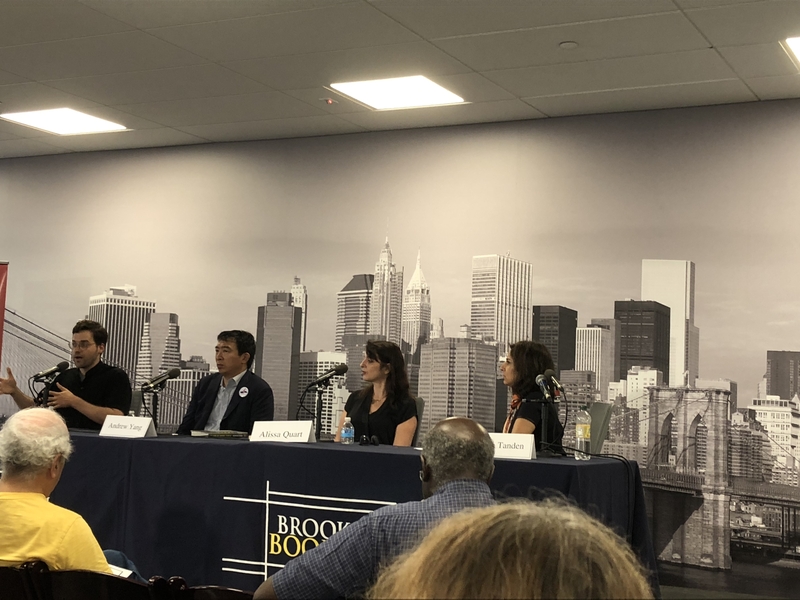 Panelists discuss economic justice at Brooklyn Law School on September 16, 2018. Last Sunday, at Brooklyn Law School, a panel of writers addressed the trumpeting elephant in the Phyllis and Bernard Nash Reading Room: the economic insecurity that persists 10 years after the global financial services firm Lehman Brothers filed for bankruptcy on Sept. 15, 2008, and plunged the world economy into a musty abyss. Alissa Quart, Andrew Yang and Nathan Schneider shared their findings on the subject of “barely getting by in America” and how the economic system of tomorrow will—should, might—look. Among the most striking ideas were worker ownership and a credit system tethered to social good. Up for discussion were various blueprints for reshaping the U.S. economy in the years, decades and century ahead. The speakers agreed that the country’s current shareholder value model—predicated on increasing the rate of return for shareholders rather than balancing their interests against those of customers and employees—requires drastic revision. The country’s current shareholder value model requires drastic revision, said panelists. His splashiest proposal was the much-bandied-about concept of a universal basic income, which he has branded as a “Freedom Dividend.” The initiative would put “$1,000 a month into the hands of every American adult,” which Mr. Yang believes would stimulate the economy. But not everyone is ready to jump on that gravy train. To some, U.B.I. sounds like a Band-Aid, masking cuts and staunching the bleeding but not doing much to heal the wound. The second blueprint, unfurled by Mr. Schneider, author of Everything for Everyone: The Radical Tradition that is Shaping the Next Economy, focused on reimagining business ownership. Over the last 10 years, said Mr. Schneider, we have lived through an “accountability crisis.” American institutions—like mortgage lenders and banks—have never been called to account for their role in the 2008 meltdown. American institutions—like mortgage lenders and banks—have never been called to account for their role in the 2008 meltdown. “Those companies were accountable upward to Wall Street and investors rather than downward to the people they served,” he said. The notion that “wage labor would be the source of flourishing for our society has really collapsed” as rising productivity and stagnant wages have colored the first two decades of the 21st century with restive malaise. Mr. Schneider pointed optimistically to a history of cooperative enterprise in the United States—of worker-owners and credit unions and purchasing cooperatives like Ace Hardware. Central to this idea is an intense, very human hankering for self-determination and a “capacity to control the economy.” He called co-ops a “hidden consensus in our political landscape,” having been included in some form in previous Republican and Democratic Party platforms. The concept continues to enjoy bipartisan support, as evidenced by the recent passage of the Main Street Employee Ownership Act. Mr. Yang was skeptical. “How can you possibly try and regulate cooperative ownership on top of this current ultra-corporatist system we have?” he asked. By contrast, he contended, a U.B.I. is more easily implementable and enforceable. “It’s the most realistic thing we can make happen as a society,” Mr. Yang said. Ms. Quart, the author of Squeezed: Why Our Families Can’t Afford America, stressed that something has got to give. Over a period of four years, she met with 100 working people writhing under the boot of the gig economy. America has a history of cooperative enterprise, of worker-owners and credit unions and purchasing cooperatives like Ace Hardware. Later Mr. Yang brought up something called “timebanking.” “There are many, many things that are central to the human experience that our monetary market right now does not attribute proper value or any value to,” he said. He advocated for the creation of a new social currency. As the panelists fielded questions from the audience, they restated their theses. Overlaying the Q. and A. was the relationship between job creation and wage growth, which like the disconnect between productivity and wages has fueled popular discontent as good-paying jobs have gotten harder to come by. With about five minutes left, an audience member asked a question about there being “too many people, not enough jobs” in the country. Do you want to help the poor? There are tried and true ways and none were on display at the conference you went to. In fact these are ways to impoverish tens of millions if not nearly everyone. The very use of "Plotting" in the headline is an indication that all the proposals cannot work. The Financial Crisis was the result of Plotting. Did you tell the person that said "too many people, not enough jobs" that there are more job openings than people available?. My guess not. A human-centered economy is what we should focus on. Unfortunately, not everyone has the understanding on what this really means. Check this website to get deeper knowledge on economic issues in America. "Anything can be better than now?" Really? What kind of seminar did you go to that does not start with proper assumptions of reality? ... Just Wondering. Mr. Wolven, 2017's highest ever recorded median household income of $61,372 broke the previous record set in 1999 by two percent. Some history on household income and national debt may interest you. Real median household income grew about five percent during a tax cut spree from 1979 to 1992. The national debt as a percentage of GDP nearly doubled. Real median household income grew fifteen percent after a tax increase in 1993. The national debt as a percentage of GDP would fall ten percentage points. Real median household income fell by nearly ten percent during a round of tax cuts from 2002 to 2012. The national debt as a percentage of GDP nearly doubled again. Real median household income jumped more than ten percent after a 2013 tax increase. Now we’re back into tax cuts which, as you note, have debt and deficits ballooning. America's greatest generation made lots of progress paying down the national debt with a federal income tax rate of 91% for the top thousand incomes. Where does debt come from.....SPENDING. Good luck with 91% federal income tax. Clearly a lesson from David Ramsey is needed for a person or two here. Mr. Rysavy, growth in real median income and paying down the debt both benefit the public interest. Yet you chose not to comment on either. May I ask why? Brandon Sanchez is an O'Hare fellow.